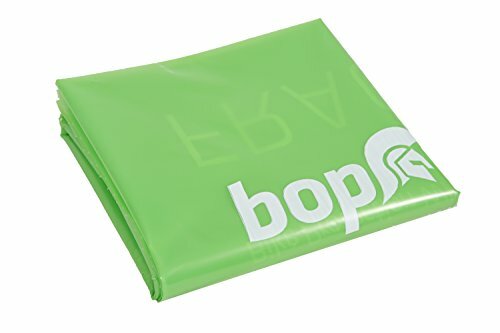 Bopworx has designed this heavy duty recyclable polythene bag to protect your bike in transport or storage. Bopworx Travel Bag is big enough for packing up a bike, yet light enough and small enough to fold and carry whilst touring. Accepted by most airlines and coach operators, the light green transparent bag protects the bike by allowing the baggage handlers see what it is when they are loading it - hopefully taking considerably more care than they do with traditional bike bags at present. It is designed so you can use it in conjunction with Bopworx's Bopwraps, Bop Bumpers, Rear Derailleur Guard and Double Bumpers to provide extra padding and protection where needed. The bag can also be used for storing muddy or oily bikes in car boots, vans or coaches. This bag generally survives for between 8 - 10 trips on planes/coaches and may need replaced after this depending on its condition. It will last longer if you are using it for storage or car boot protection. If you have any questions about this product by Bopworx, contact us by completing and submitting the form below. If you are looking for a specif part number, please include it with your message.